Starting your own business is a risky proposition. This is the reason getting capital is so costly and difficult. Investors’ goals, at least the ones who are trying to maximise their financial returns, are looking to do so at a minimum risk. Hence getting at the front of the venture capitalists potential candidates line means increasing returns and/or reducing risks. The only way I know how to do both at once is to address your commercialisation risk. Just about every risk one can think of (even health related ones) can be a concern when starting your own company. The risks an entrepreneur needs to consider are the ones that have a combination of significance of the consequences and likelihood of happening that mean your company’s revenues, or worse its survival, are at risk. Classifying start-up risks is in itself a risky proposition as various types of start-ups will classify a same risk in different categories. However, with the objective of simplification in mind here are the main start-up risk categories. Can the company deliver a product which lives up to all of its promises in a timely, cost effective, scalable fashion? Will the company have sufficient funds to develop until it starts getting sales revenue (also known as the runway)? Once it starts selling, will it have sufficient funds to ensure operations, growth and unforeseen expenses? Do the founders have the necessary skill set to take the company to where it wants to go? Are the critical functions covered? Is the business model the right one to get optimal growth? Have the pertinent political, environmental, social, technological and legal risks been addressed in a fashion that will enable the company to see them coming and take the necessary actions in a timely fashion to mitigate them? Is the product’s value proposition sufficient to attract buyers? Is the market sufficient to sustain the company’s goals? If the first two questions are answered positively, this is usually the killer question; does your start-up have the abilities to sell its products to its target markets? The commercialisation risk incorporates many risks that can also be found in other categories. 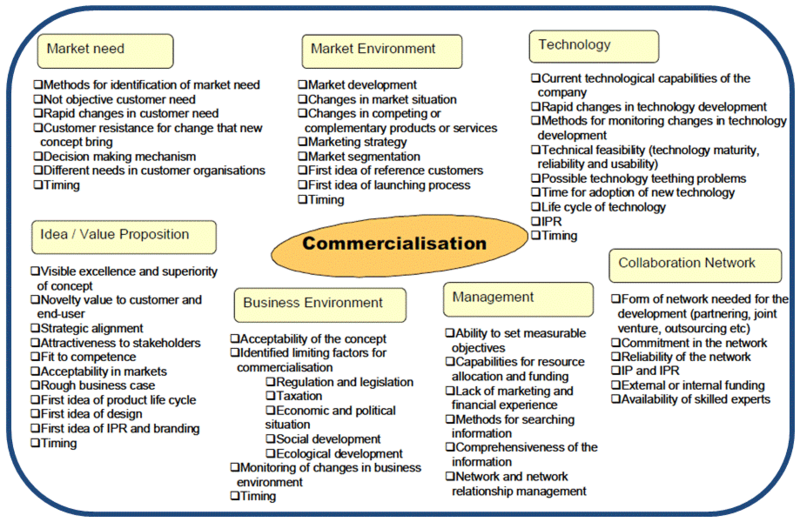 The figure below shows a map of commercialisation risks that should be taken into consideration. Source: Luoma, T., Paasi, J. and Nordlund, H. (2008), Managing Commercialisation Risks in Innovation Development: Linking Front End and Commercialisation, In Proc. of The XIX ISPIM Conference. Lean Startup strongly advocates getting to know your market before you develop your product. You start by having a business idea; you quickly identify the underlying hypotheses of your idea and then devise an experiment where your minimum viable product (MVP) will test the validity of these hypotheses. Inevitably, at one point in your series of experiments, you will need to test the hypothesis that your market is willing to pay money for your product i.e. you can sell. Later you will need to test that you can scale your business idea to a level that is sustainable, i.e. sell enough to sustain your business. These experiments, that are meant to collect the most information with the least effort in order to get you to your product/market fit, are the embodiment of reducing your commercialisation risk. Other practices encouraged in Lean Startup are to take the time to properly define your value proposition, methodically collect data to validate your market hypotheses and understand the cues from your market. Use management tools, such as the Business Model Generation, adapted to the start-up environment. All of these Lean Startup practices are meant not only to ensure you know how to sell your product but also to reduce your various start-up risks. There is a reason why venture capitalists are, not only taking notice of start-ups using the Lean Startup methodology, but increasingly encouraging it, it makes their job easier.